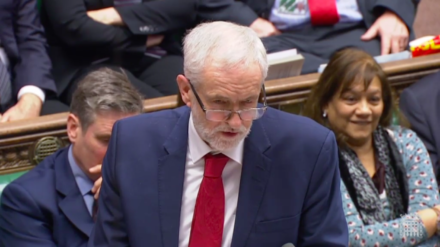 Below is the full text of Jeremy Corbyn’s speech in the emergency Brexit debate. Mr Speaker, I have had the privilege of serving in this House for 35 years and I’ve had strong disagreements over policy with every Prime Minister in that time. But I have never in all those 35 years witnessed such an abject mess as this Prime Minister has made of these crucial Brexit negotiations and in presenting her deal to this House. Every Prime Minister loses votes and gets things wrong. But yesterday the Prime Minister demeaned her office by unilaterally taking her discredited deal off the table and running away rather than face the verdict of this House. There’s nothing wrong with standing by your principles but this deal is not one of principle and she’s not even prepared to stand by it. Yesterday Mr Speaker they didn’t even have the decency to allow this House a vote on withdrawing the business. Parliament may not have had the chance to vote down her deal, but as she herself has admitted, if she had put it before this House it would have been defeated by a significant margin. She has no authority to go to Europe and negotiate when she can’t even command a majority in this House. She’s wasted £100,000 of public money in just seven days on Facebook adverts trying and failing to sell to the public her dog’s dinner of a Brexit deal. In the days when she and I served on local councils, council leaders would have been surcharged for wasting public money like that. She has failed to convince this House, failed to convince the public and she now seems doomed to fail to convince the European Union to accept any meaningful changes. She cancelled her own cabinet meeting this morning – presumably she’s not even sure if she commands a majority there anymore? And who can blame them? About a dozen of them were sent into the TV and radio studios to deny the Prime Minister would pull the vote shortly before she phoned to tell them she was pulling the vote. The Northern Ireland Secretary was quoted saying: “the UK must move on with Brexit or risk being riven with division”, shortly before the Prime Minister decided not to move on with Brexit. This is the same Prime Minister who said hers was the best deal and the only deal. So what is she doing today in Europe? This runaway Prime Minister is not even seeking to renegotiate, she confirmed she is seeking only ‘reassurances’. Our Prime Minister is traipsing around the continent in pursuit of warm words. It’s the unspeakable in pursuit of the unwritten; a waste of time and a waste of public money. But worse than that, it shows that yet again the Prime Minister is not listening. It is not only the backstop that is a problem for members. Many will not vote for a blindfold Brexit on the basis of a 26 page wish-list; that fails to guarantee the “frictionless trade” that the Prime Minister promised; that fails to maintain our membership of vital agencies and programmes; that fails to ensure our rights and protections will keep pace; that fails to provide for a comprehensive customs union with a UK say. Yesterday, following her statement she failed to answer a single one of my questions, so last night I wrote to her with the leaders of the SNP, Plaid Cymru, the Liberal Democrats and the Greens. We set out five questions to the Prime Minister. Sadly she’s not here to answer them. Because while she sends our country into Brexit-induced paralysis… The coming winter threatens to deepen the crisis in our NHS. Homelessness and rough sleeping continue their unrelenting rise. The local government funding settlement is delayed meaning our hard-hit councils can’t start budgeting for next year, and neither can the police facing rising violent crime because their funding settlement is delayed too. Another Government contractor is at risk and thousands of jobs too, as Interserve teeters on the brink of collapse. And all the while the economy is slowing, high streets are in crisis shares are tumbling and the pound is plummeting. This isn’t strong and stable government, it’s weak leadership from a weak Prime Minister. Mr Speaker, if she comes back with nothing more than warm words then she must immediately put her deal before this House, no more delays, no more tricks, let Parliament take back control. If not, then she must go. We cannot tolerate delay any longer. With a legally enshrined exit date of 29 March 2019 just over 100 days away, we cannot allow this shambles to endure and neither can we risk falling into ‘no deal’. We will work across this House to prevent any further damage to our economy to our international standing and to our democracy. So I say to the government benches opposite, let parliament have its say on this shabby deal and let parliament take back control.